I have observed that the chance of a rabbit getting poorly adopted from a shelter or impulsively bought at a pet store is directly proportional to how cute he or she is. I always worry when a new super cute dwarf or over-friendly loppie gets brought in and it is not because I am worried that they are going to languish there for a long time. Actually, just the opposite is the case. Those “cute” types of rabbits rarely last more than two weeks in the shelter awaiting adoption, while other types of rabbits can wait for six to twelve months before someone decides to take them home. People often ask me, “Is that really a curse”? While I feel the answer is not just a black and white one, I feel that many times it is. One can hardly go wrong bringing home a lovable friendly lop-ear rabbit, yet I cannot tell you how many times one has been returned to the shelter after six or more months of being at an adopter’s home. I think the main reason that this happens is that the person who adopted the bunny was not prepared for what bringing a rabbit home was all about. So many people who adopt a rabbit on impulse do not give any thought about where or how a rabbit is going to be housed and cared for until AFTER they have brought him home. They may have had good intentions and when they turned the rabbit loose to run free in the home, but that is a recipe for disaster. A unbunny-proofed home is no place for a new rabbit to roam. Inevitably there ends up being a lot of damage to computer and phone cords, not to mention other miscellaneous things that get chewed on, too. Very often this results in the new rabbit being banished to a quickly built hutch out in the back yard. This never turns out well for the bunny and it is actually a blessing if his parents DO decide to return him to the shelter. Otherwise, he will live out his days very lonely and often not receiving the proper diet or care. The other scenario that I have seen a hundred times is a small highly energetic and active Dward rabbit, such as a Netherland Dwarf being adopted within days of coming to the shelter. The people who bring him home were seduced into adopting him by his small size and “cuteness”. What they do not realize at the time, is that these high energy bunnies are best adopted by experienced rabbit lovers who know how to bunny-proof every nook and cranny of their home and to exercise the rabbit so that he does not become frustrated. 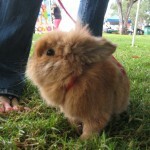 Sometimes the family will adjust and learn how to keep this tiny bundle of energy busy and end up with a happy rabbit. Too often, I hear them say, “What was I thinking” when they brought him home from the shelter because they do not understand until it is too late that they have taken on a huge responsibility. I have found that larger rabbits and breeds that are not in high demand spend a lot more time in the shelter, waiting for their new forever homes. 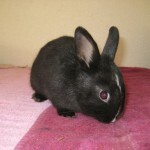 The good news is that when someone comes in looking for this kind of rabbit and adopts him, that it usually ends up being a better situation with people who know and have had rabbits before. I have many “happy ending” stories with these type of bunnies whom I have cared for at our shelter. It is what keeps me going, knowing that some rabbits do end up with a much better life after they are there. My biggest worry is for the buns who are hastily adopted, usually by people who were sucked in by the “cuteness” factor. I always try and coach these people to take a step back and go become a little educated about the big step that they are about to take. If all of the adoption staff at shelters would coach potential adopters this way, it would lead to far better adoptions at the shelters. To my disdain, many shelters are operating on a revolving door agenda where they need to adopt out as many of their charges as they can to make room for the new critters coming in. For them, it is the only way that they can keep from running out of room and being forced to destroy some animals that they cannot care for. While some shelters are moving away from this model, the harsh reality is that most cannot afford to. There is simply not enough space or money to care for unlimited animals that way. I can only hope that “most” of these hastily made adoptions turn out well, but I know from seeing some of the results that there are some that do not. This is why I tend to feel sorry for the very friendly or overly cute new buns who come to the shelter. I know that their “handicap” will make them more vulnerable to a “bad” adoption. A shocking proposal by Governor Jerry Brown wants animal shelters in California to no longer be required to hold cats and dogs for more than 72 hours. Shelters would not have to provide veterinary care to animals who need it, and rabbits, reptiles, and other animals could legally be euthanized as soon as they arrive. Over the years I have been working at the local animal shelter, I have seen a slow improvement for the homeless animals, but this proposal will set all of our efforts back decades. Please make a brief, polite phone call today to Governor Brown’s office at 916-445-2841, and ask him to scrap his proposal to remove basic protections for shelter animals. I received my book proofs last night and I am extremely happy with how they look, except for the cover. For some reason, the printer chose to change the design by the way that they trimmed the book cover and I find it takes a lot away from the presentation. We are waiting for a response from the printer before telling them to submit the book to Amazon for sale. They promised a response within 24 hours,. so it should not be long. I have been working on the ebook non-stop for the last week. I had to completely relearn how to lay it out, since the ebook publishers will not accept a book that is not done in MS Word. I spent weeks learning how to do it in Adobe InDesign and now I am having to relearn the process all over again. I have figured out the system and I have the first 1/3 of the book done and expect to finish the ebook by the end of this week. YIPPIE!